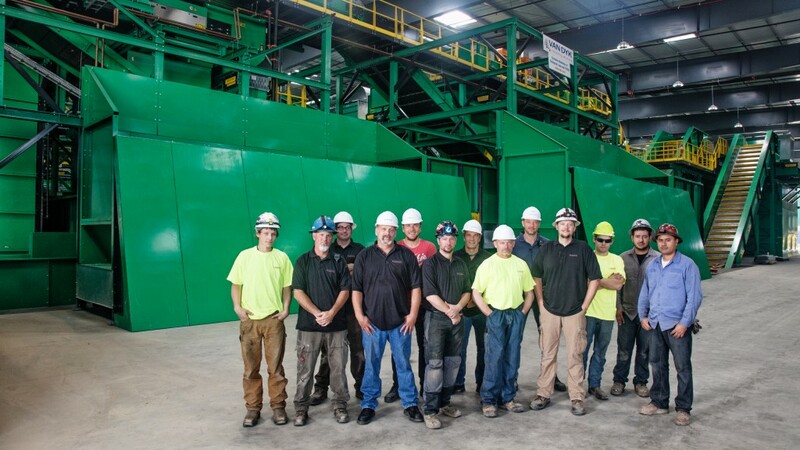 The MRF installation crew at SANCO Resource Recovery in Lemon Grove, California. Lovewell says the topics focused on in their webinar were similar to the conversations being had around the industry on a regular basis this year, including at the first MRF summit, held at Wastecon 2018 in Nashville. He says the conversation centres around broad questions including: What can the recycling industry do considering the challenging global climate we find ourselves in? Where can materials go? And what does the future look like for paper, plastics and other recyclables? Lovewell says that in the simplest terms, the current crisis in the global materials recovery industry stems from China's import policies which have come into place since 2017. "The MRF crisis has everything to do with our inability to ship material to China," explains Lovewell. "The latest stage (called BlueSky) which began in the Spring of 2018, where they completely shut off North American exports for a period of time, is what started the crisis, because nobody really knew where to go with their material - especially fibre - everyone has been frantically trying to find buyers. "And then there are the restrictions that China has put on quality. They've now said that recyclers can start shipping material to them but that it has to meet a very high quality specification. For fibre, the specification is at half of one percent contamination levels. It's not economically possible to really reach that quality for medium to large MRFs. Volumes of material are just too high." In particular, the specifications for fibre, including mixed paper, newspaper and cardboard are extremely challenging to meet. "If MRFs want to be shipping end product to China, they have to slow down their throughput, and add sorters and equipment," he says. Plus, due to the risk of shipping material and it not being accepted at Chinese ports, there is a high potential to have ships turned around, with product rejected and sent back to its source. At about an average of $10,000 per container to have material re-routed back to North America, it's very costly. "And then you still have to do something with material when it comes back," says Lovewell. On the line at JP Mascaro & Sons, Total Recycle, in Birdsboro, Pennsylvania. With single-stream MRFs, the majority of plastics processed are either PVC or HDPE. "For much of this material, there are plants here in the United States and there's capacity domestically," explains Lovewell. "A lot of MRF plastic is easily processed domestically, which is similar to nonferrous and ferrous metals. It's really paper that's the big issue. "There's not as much of a domestic market for it," he continues. "But that's changing as well. There's a couple of plants that are opening up recently, and there's movement in the United States to open up more markets for paper. "But it's going to take time. You can't just do it overnight. If you want to put in a new paper mill, it takes probably 18 months from the time that a project is given the go-ahead. It takes time to do the design, get the funding and the permitting, and to construct the infrastructure." According to Lovewell, a major factor that has increasingly played a part in creating challenges at the MRF, especially since the new Chinese regulations have been put in place, is inbound contamination. Meeting standards of 95 percent pure fibre is achievable, but with the average quality of the inbound material being so poor, it makes it extremely difficult. "We've seen upwards of between 15 and 20 percent inbound contamination in many regions," he says. Inbound recyclable material contamination has increased since the advent of single-stream systems, where fibre and containers are collected in one bin. This contamination can range from irregular items that need to be manually removed, such as diapers, to flexible packaging, such as plastic bags, to organics and food waste - especially in mixed waste streams. Lovewell says that while contamination of plastics and metals does occur, it is not as serious an issue, "because metals go into smelting equipment and all the plastics go through bottle washes and such to be cleaned. But it's really hard to take dirty fibre, clean it and get a clean recycled product from it." He continues, "Flexible packaging is probably the biggest contributor to contamination. It looks like paper, it acts like paper. And because of the density of the material, it's extremely hard to remove from the system manually and requires a large amount of automation. He adds that so many bags end up at the recycling facility, in large part, because it's a means of transporting material from inside a house to the bin outside. This plastic ends up at the MRF, causes equipment problems, and is extremely hard to recover. The other large contingent of contaminants that end up in MRF systems are really anything that people think is recyclable that is actually not. "There's really only a couple of things that are truly supposed to be included in most recycling programs: plastic containers one through seven, aluminum and tin cans, and cardboard and paper," Lovewell says. "MRFs get a lot of plastic bags, and other miscellaneous plastic items that don't fall into any of the categories of the one through seven. They just end up in the system." He says MRFs and other recycling facilities regularly also receive holiday lights and extension cords, or hoses that end up getting wrapped up in equipment, jamming systems and causing downtime and increasing the potential for injuries to personnel at the plant. Plus, there are large volumes of e-waste, including batteries, as well as items such as small propane cylinders, both of which can result in explosions, endangering the lives of MRF workers and causing damage to expensive infrastructure. "Outside of the contamination issue with film bags, it's really about a misunderstanding of what is recyclable and what is not. You could probably create a list of a million things that show up at a MRF that are just not recyclable or included in the program." Clean paper comes off the non-wrapping screen at Total Recycle. The path toward a solution to current challenges at the MRF with respect to contamination involves educating about required changes at the source and at the curb, combined with improving personnel and technology that can more effectively separate materials at the MRF. "I would say education is the start," says Lovewell. "Right now, there's literally no education in a lot of areas of the U.S. There are certain areas that are doing a good job. Minneapolis does a really good job at educating the folks there about what is recyclable. So their actual inbound contamination rates are some of the lowest in the U.S., at about five to seven percent on the inbound compared to 15 to 20 percent in some other places in the country. "We also have systems in Canada, and what we've seen is that contamination levels vary there just like they do here in the United States. We have plants there that have 15 to 20 percent contamination on the inbound as well." In some places, however, like British Columbia, Lovewell says recyclers and municipalities are doing a particularly good job. "I think they have a better education program," he says. "I think there's more programs in place there that do a better job at educating people and enforcing some of the recycling rules. But overall, I wouldn't say that Canada is any further ahead than the U.S. with respect to curbing contamination levels. I would say Europe is far more advanced than both the U.S. and Canada when it comes to recycling. It's a little bit difficult to understand why they're so far ahead, but it might just be as simple as people caring a little bit more about what they're doing, and they're making more conscious decisions about what they're putting in the bin and where they're taking it." "I've been living in Chicago for the last three years," he continues. "I've never received any information about recycling. My family lives in Maryland and they've had the same recycling bin for the last seven or eight years, and it still includes instructions that read; ‘Put your plastic bags in the recycling bin.' They've never received a flyer, they've never received an update or any information about guidelines for recycling." "So education is what I say is step one and is definitely the biggest thing that needs to be worked on across the U.S. and Canada." Inside the facility at SANCO Resource Recovery, California. According to Lovewell, recycling plants are having to spend great amounts of money to upgrade their systems, to improve separation in order to stay in business. And while the volume of clean material coming into systems (especially fibre) as a percentage is decreasing, the percentage of unclean incoming material is increasing. This is combined with disappearing markets, including China. "Many plants are struggling to make money - because they're getting hit on all ends. They spend money and make less," says Lovewell, adding that he agrees that increased taxes designed to support recycling facilities would help, and would be warranted. "People pay $150 or $200 for cable every month, and don't really blink an eye at it," he says. "It costs an average of about $15 to $20 a month for trash. So, if that was increased by $10, for example, it does not seem like much, compared to $200 for cable." Lovewell says he hopes such changes will be part of the solution going forward, but it would be challenging. "One difficulty is that there are contracts already set up and in place. Many areas have long-term contracts with municipalities for both hauling and processing, so you can't just change the contract. You have a 10-year contract that says that this is what you're charging. If you're a MRF, you can't say, "Residents and businesses need to start paying more to help effectively process materials." He continues, "It's hard to change. It's hard to start telling people that they need to pay more - it's just bad for business. So there's a political game involved. And then the question is: How does it change? Would it be a national change? Would it be a federal tax that would support recycling and solid waste efforts or would it be a state, provincial or local tax?" Lovewell is reluctant to say it, but adds that the only way to do curb contamination may be to penalize waste generators. "It's either you recycle correctly or you get penalized for it," he says. "And really, the reason why some of the increase in contamination has occurred is that advancement in technology and the growth of single-stream systems has actually hurt us all at the curb. "Sorting has been lost at the curb to some degree, with unrecyclables not being seen until it ends up at the plant. And recycling facilities are processing so much material that it's really hard to audit every single truck that's coming through, nearly impossible to do. So it's tough." Van Dyk’s LUBO non-wrapping 440 Starscreen features specially designed shafts and stars that resist wrapping, which dramatically reduces time wasted on excessive cleaning and maintenance, and helps to achieve high-purity output. According to Lovewell, the other part of the equation to solving the current MRF crisis, beyond improved education efforts, is developments in recycling equipment and technology. He points to advances in screening and sorting technology to separate paper (2D) from containers (3D), as central to building success at the MRF going forward. "Since there's so much plastic film in our systems, the old screening technology just doesn't work effectively," he says. "Film wraps in the screen, or it travels over a screen with paper, and you can't just do a simple 2D paper separation from 3D (containers). "One of the big advances that we came out with in late 2015, which we have deployed in many of our facilities, is our non-wrapping screen. Traditional screening utilized a certain screen design to separate paper from containers. Over the years, as the volume of film and long stringy items has increased in the inbound stream, those screens have seen a lot of issues. They get wrapped with that material, and it causes significant wear on the stars (screen hole configuration). "So we developed a non-wrapping screen that eliminates the wrapping of this plastic film, which has helped increase the quality of material, including fibre, being produced, and has saved a significant amount of time on labour required for cleaning screens and changing stars. "The latest screen technology has also helped increase throughput at some facilities where we've done retrofits, where they have had to slow down due to fibre quality requirements. They've been able to bring their throughput back up with these new screens." With the new MRFs that Van Dyk is currently building and planning to build, the concept of positive sorting is key. "Positive sorting is a name we've coined to describe the way that we are looking at processing single-stream material today and in the future," says Lovewell. "A traditional sorting system makes what is basically a rough guess based on density and shape of the materials. Traditional screens do a decent separation of 2D from 3D, but since the screens can't make an intelligent decision, other than with 2D/3D material, anything that's 2D, which includes a lot of your flexible packaging, including plastic bags, goes with the paper and contaminates the paper. "With positive sorting, the idea is to utilize advancements in optical sorting technology to positively recover fibre so that an intelligent decision is made based on the actual commodity. Currently, we use a lot of optical sorters on the container line to recover PET and HDPE, and the technology is effectively making a positive decision. We can see up 98 percent quality on those recovered products before any kind of manual sorting is done." He says this compares to using traditional screening technology for fibre, with which, before manual sorting is done, MRFs might see upward of 15 percent contamination in their product. To get that down to the "China-grade specification" of half a percent, a facility would probably need 50 people on the sorting line. "Using optical sorting and today's smarter technology to recover fibre will get you closer to meeting those quality specifications," Lovewell says. "And it also allows material recovery facilities to adapt to the future. This article was originally published in Recycling Product News, October, 2018, Volume 26, Number 7. Machinex recently carried out a full design review of the MACH Hyspec optical sorter. As part of this process, the decision was made to totally revamp the overall appearance of the unit. Niagara Recycling was incorporated in 1978 as a non-profit social enterprise company. Norm Kraft started with the company in 1989, became CEO in 1993, and has never looked back.